I’m getting back into the swing of using up everything that comes in my CSA bin before the next one arrives. Sometimes, it’s hard…but this past week, I have literally used up every bit of produce that came to me last Friday in my green bin of happiness. Ah, I love Friday because it is BIN DAY! So, after using up the cucumber (I made a childhood favorite…cucumbers in vinegar), zucchini, squash, blueberries, apples, green beans, broccoli, watermelon, and onion, all that remained was the kale. And, I do love cooking with kale. Usually I make kale chips or use it in a breakfast egg scramble of sorts. But I wanted to get a little more creative than that this time around. So…with just enough white wine remaining in the bottle in the fridge, I set out to master…pasta and kale…with white wine. The premise of the recipe was skimmed over while reading through the Funny Love blog. And from there, I tweaked it to fit my dietary needs. What emerged was a healthy, delicious, and runner-friendly (non-runner friendly too!) meal this evening that both my roommate and I sat down and devoured while watching Friends on Netflix. Life…can be good and delicious all at once. While the pasta is cooking, pull out a pan I used the one I was using to make the sauce) and add about an inch or two of water with about a teaspoon of salt. Place pan on stove and bring water to a boil. Cut the kale into large strips and remove the stems. Put the kale into the boiling water for about a minute. Drain the kale and set it aside. In the same pan, prepare the sauce. Add a drizzle of olive oil, the red pepper flakes, and the minced garlic and cook over medium heat, for about 2-3 minutes, until the garlic is soft and golden. Do not burn the garlic. It will make everything bitter. Stir in the wine. Allow the wine to come up to a boil and reduce for about a minute. Then, add some of the starchy pasta water, if you’d like a bit more liquid in the dish. 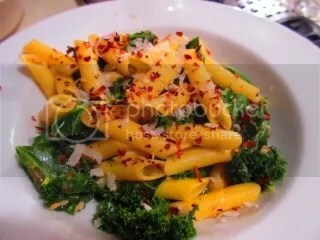 Stir in the drained pasta, the kale, and some Parmesan cheese (as much as you’d like). Season with salt, more cheese, red pepper, or pasta water as you deem necessary. This turned out to be a light dish, despite having the pasta integrated into the rest of it. I found it a great way to use of a bottle of white wine from the fridge so that it didn’t go wasted. And…I love finding new ways to enjoy kale! Packed with nutrients, light, delicious…yeah…it’s a perfect meal. And one I might consider the night before a long run…should this hip ever improve enough to get me back out onto the roads. This entry was posted in Cheese, Clean Eating, Event, Food, Gluten-Free, Italian, Local, Pasta, Recipe, Sauce, Vegetables, Vegetarian, Wine by The Celiathlete. Bookmark the permalink.